We hope everyone had a grand Thanksgiving feast. We went to Atlanta for a family gathering. As the years go by and our kids' families grow, getting everyone in the same place for a few days becomes a rare and special event. Seeing the little cousins interact is so cute. These 2 kiddos are within a year in age, and they had a great time. Whether working on I-pad puzzles or listening to Aunt Tess/Mom read about the Grinch, they were bonding in a special way. The 4 year old leans on her older cousin, learning the joys of video games. As it turned out, her smile was a bit fake. Those dragons on the screen were scary! Is Uncle Eric teaching his niece about plasma physics? Could be! Looks like she's paying attention. An excellent time was had by all, thanks to our Atlanta son and his wife for hosting the fun! This solo bird, unafraid, was hopping around in a pool in which the horses were drinking. He looked like a crow, but the whitish wings are confusing. Maybe it's reflected light? Not sure. sometimes rooting them out from soft dirt along the edge. While riding in the upper end of Horshoe Canyon, Boss pricked his ears at movement above us on steep terrain, just below the Navajo cliffs. He's usually the first one to spot wildlife. We followed his lead and scanned the area for motion. Can you spot anything mid-photo? We soon saw these wild burros, who stopped to take a good look at us, the interlopers passing by. While driving along the road from the Horseshoe Canyon Trailhead, we saw a group of wild horses. Note the many bite-shaped scars on this old warrior's body. They galloped off across the desert. Regarding the human critters who come this way, the information kiosk along the road has posted the above sign. Apparently, the 127 Hours movie/book has attracted a plethora of climbers to Blue John Canyon. 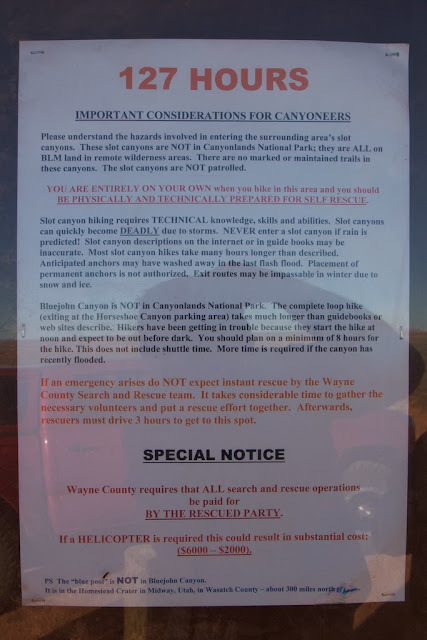 Sounds like no one's too interested in rescuing the unprepared, and you can expect to pay Wayne County big bucks if they have to go in to find you. Beware! A trip to the canyon country on the West side of the Green River is not complete without a ride into the Horseshoe Canyon Unit of Canyonlands National Park. Above, Steve and Boss pause at an overlook into the canyon. The trail was originally built in 1929 by local cowboys with sticks of dynamite and a paycheck from Phillips Petroleum. The oil company wanted the "road" so they could bring in supplies to drill a well on the other side of the canyon. The well was a dry hole, but the "road", or what's left of it, remains. You can see Steve leading Boss down a steep stretch of sandstone in the middle of the above photo. In 2 places, we found dinosaur tracks that had been helpfully marked by the rangers with rock circles. There are 3 toes, but the third is below the 2 deep ones, and not weathered out enough to be visible in a photo. We are a little late for the autumn colors, but some cottonwood trees are still wearing gold leaves. Tourists go to the canyon to see the Great Gallery, known for its Barrier style rock art (named after Barrier Creek, which is represented this time of year by a few pools in Horseshoe Canyon). Native Americans lived and created their art masterpieces here about 3000 years ago. The Great Gallery figures loom above the canyon floor. Some of the human figures are larger than life. The above figure looks a bit like a martian to me. Humans have a need to put their mark everywhere, even where it may not belong. One of the names above is Joe Biddlecome, dated 1911. Joe was one of the first ranchers in the area. Probably he had no clue that he was scratching over irreplaceable 3000 year old art. The majesty of steep canyon walls surround us. Do you see any familiar feature in this rock tower? The topmost portion reminds me of a cat's head, complete with mouth, nose and ears. Steve thinks it's a desert turtle, long neck extended as it surveys the scenery. What do you think? Next time, I'll show you a few live critters we saw along the way. On one last trip to Southern Utah before the snow falls, we spent 3 days in canyon country. The first day, we rode near Robber's Roost, beginning at the turnoff to the Ekker Ranch at Crow Seep. Joe Biddlecome built the first cabin at Crow Seep in 1909, when he moved there with his family. The photo above shows the location, but the main building is obviously newer. The ranch is still owned by Joe's descendents, the Ekkers. Joe lived on 40 acres that featured one of the rare sources of water. He also had grazing access hundreds of acres of surrounding federal lands. Before the Taylor Grazing Act of 1934 and subsequent creation of the Bureau of Land Management (BLM), there was very little regulation, which resulted in a lot of overgrazing. Over the years several other ranching families moved into the area and also ran horses, sheep, and cattle. The Robbers Roost outlaws, who had used the canyons as a hideout in the late 1800's and early 1900's, got old and tired of hiding out. If they'd managed to avoid prison and/or acute lead poisoning, they retired to more socially acceptable professions or moved elsewhere. With more roads making the land accessible to lawmen, young folk tended to find work that was better for their long term health than the old, previously admired, bank-robbing and horse-thieving trades. Joe's daughter, Peal Biddlecome Baker, took over the ranch after Joe's death from a tonsillectomy. (Tonsillar abscesses had plagued him for years. He thought one more episode could kill him, so he finally tried surgery -- maybe not such a good decision, as it turned out.) 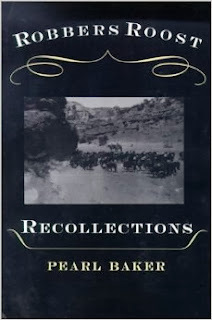 Pearl wrote a book about her years on the ranch, Robbers Roost Recollections. Later, Pearl sold out to her sister Hazel and Hazel's husband, Arthur Ekker. We rode toward Angel Point (the start of an old horsethief trail across the Dirty Devil) along an old road, and later a ghost road, enjoying the old west scenery. This lonely tree somehow manages to thrive on the vast desert plain. We didn't reach Angel Point, but we figured out a good route for next time. As sunset approached, the canyons turned golden. And as the sun drifted below the mesa tops, the land took on a rose glow. The light transforms the land into a magical place, irresistibly beautiful. Of course, the downside is the quick drop in temperature, from near sixty to somewhere around 20 degrees F for a low. Brisk! Camping involves lots of down comforters. The night sky in that desert land is as star-bright as in ancient times, with no cities close enough to taint the darkness with artificial light. Venus was high and bright in the hours after sunset. The Pleides and Orion were clearly outlined after midnight. The Milky Way dusted an arc across the sky, and shooting stars shone in a brief trail of glory. No photos, so you'll just have to use your imagination.